I-270 · Eisenhower Memorial Hwy. SHA I-270 strip map with interchange details, 1976. 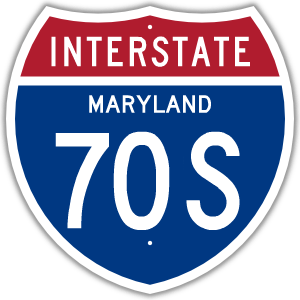 I-270 is one of the oldest sections of modern expressway in Maryland, the first section being in place by 1953 (and before the Interstate system). The official map from that year shows it complete between route 109 and US 15 (now MD 85). It was made the new US 240, and I-70S when the Interstate system arrived in 1956. US 240 was concurrent until it was decommissioned in 1972. The next year, I-70S was changed to I-270, per the AASHTO directive to phase out suffixed Interstate numbers. Prior to this change, I-270 was the short western connector with I-495 at 70S's southern end (containing the interchange with Democracy Blvd). 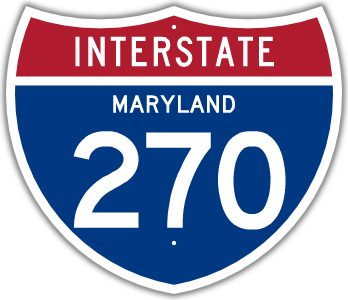 Today it's officially I-270Y in SHA records, but commonly referred to as the 270 Spur. I-70S was to extend inside the Capital Beltway roughly along the Metro line, but this plan was killed along with almost all the other unbuilt DC area freeways. The I-270 corridor in Montgomery County has developed rapidly over the last 30 years, and 270 itself has gone from a 4 lane dual to a 12-lane highway with local and thru carriageways and HOV lanes. It's the closest thing to Los Angeles there is in Maryland, and it's every bit that, California-sized backups and all.